Pig: Toilet paper tube crafts - C.R.A.F.T. 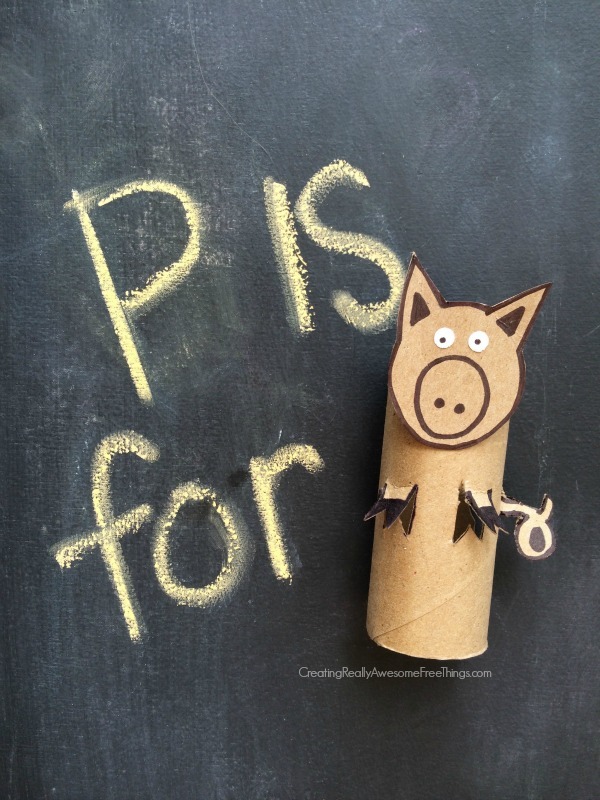 P is for Pig, of course! Max loves the book, If You Give a Pig a Party , and his oinking skills are pretty adorable, if I do say so myself! First, use a pencil and doodle a pigs head on the back of a cereal box. A circle with two triangles at the top will make a perfect pigs head. The lid of a milk carton is a good size for a pig head if you are looking for something to trace! Then, use a black marker to trace over the pig’s head and cut it out with scissors. Add a snout and two smaller black triangles inside of the ears. Now, it’s time to finish up the pig’s body. Use the black marker to make hooves and a tail and then carefully cut them out of the pig being sure to leave the limbs attached the the toilet paper roll! Add 2 hold punch eyes to the pigs head, and voila! Cutest little piggy you’ve ever seen! Pigs are omnivores, like humans! That just means they eat plants and other animals. Male pigs are called boars and female pigs are called sows. Pigs are very clean animals. They roll in mud to cool off. love him!!! I just went on and on in my blog about repurposing household trash into art!! Love to see others doing it too!! This is one of the cutest ideas I’ve seen for re-purposing toilet paper rolls!